Prostanthera serpyllifolia is known as the Thyme-leaved Mintbush. This is a dwarf, spreading shrub reaching a height of one metre with a similar spread. Small leaves are one centimetre long, ovate, deep green, crowded and glossy. As with most Mintbushes the foliage is aromatic and rather attractive. The flowers are tubular, two centimetres long and compressed sideways. Blooms may be reddish with yellow tips, bluish-green or yellow. As the image shows we have the yellow-flowered form. The flowering period extends from August to December and at this time blooms are eye-catching and copious. The flowers are a different form to “conventional” Mintbush flowers. Well known species such as Prostanthera ovalifolia have regular-shaped flowers and have been placed in the Prostanthera section. 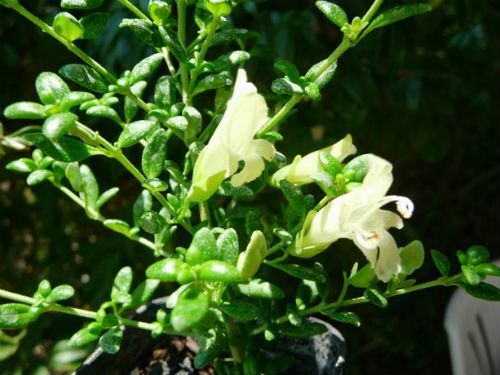 Those with tubular, compressed flowers, such as Prostanthera serpyllifolia, are in what is known as the Kalanderia section. Another species in this section is Prostanthera aspalathoides (see our article). Mintbushes with these tubular flowers would possibly be more attractive to honeyeaters. Prostanthera serpyllifolia would be an ideal plant for rockeries and native cottage gardens. Propagation, from cuttings, is fast and satisfying. Prostanthera serpyllifolia is a widespread species and is found in western New South Wales, Victoria, South Australia and Western Australia. The species name means with leaves similar to Thymus serpyllum hence the common name.